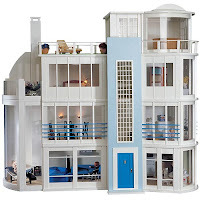 I wish there were more modern dollhouses on the market---course then I would probably be incredibly broke from spending money on them. 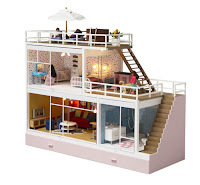 If I ever stumble upon some extra money (because people are bound to do that from time to time), I think I will start a modern dollhouse company. 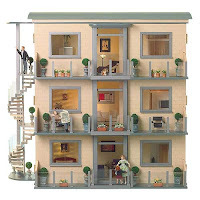 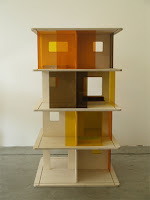 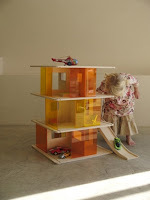 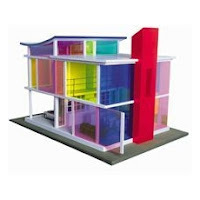 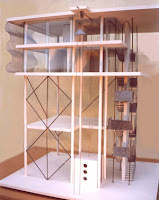 Excellent rundown on some of the more interesting dollhouses produced.. 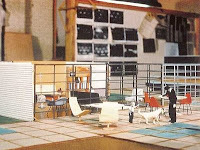 I too am in search of the elusive Eames for Revell prototype..
a few interesting vintage pieces that I have in my personal miniature architecture include: "Debbie's Dream House" by Deluxe, Irwin's "Interior Decorator Set" (similar to the Eames concept) , the Marx "A-Frame" and futuristic "House of Tomorrow" in colored plexi reminiscent of the Bozart House. 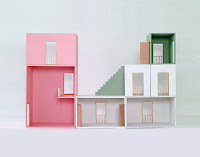 The CCA - Canadian Centre for Architecture in Montreal has a nice collection of architectural toys and has produced several exhibitions about architectural toys.